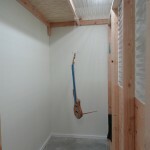 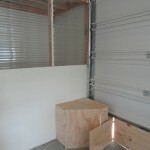 I added a dedicated spray booth to a corner of the shop. 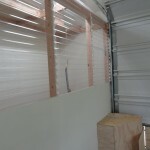 Corregated polycarbonate panels allow light into the booth and a fan pulls air from the shop through filters and then out the garage door. 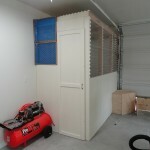 An insert containing the fan can be moved into place, and plywood panels block off the rest of the garage door opening so that little air comes back in from the outside of the shop.